In pardoning Sheriff Joe Arpaio, President Trump illustrated why he is a cut above other politicians. Without waiting for judicial activism to drag on for years in the Ninth Circuit, Trump used his constitutional authority to stop the long-running witch-hunt against a good man who has devoted 50 years to law enforcement. Trump’s pardon of Sheriff Joe was the kind of Trumpesque move that millions of Americans have been waiting for. Trump acted on his own instincts, and perhaps even against his legal advisers who have been urging him to adapt to business-as-usual in D.C., rather than changing it. Trump’s audacious pardon confirmed why Phyllis Schlafly saw in Donald Trump something she had not seen in any other presidential candidate since she wrote her classic “A Choice Not An Echo” more than 50 years ago. Sheriff Joe is hated by the kingmakers who want open borders, and Trump’s pardon delivered a stunning setback to their globalist agenda. In 2012, Phyllis wrote about how the pro-amnesty crowd waged an expensive campaign that year to defeat Sheriff Joe, but he won his reelection at the age of 81. Sheriff Joe stood up against Obama, and liberals have been determined for years to punish Joe. A decade ago Phyllis and others repeatedly urged President George W. Bush to pardon two courageous border patrol agents, Ignacio Ramos and Jose Alonso Compean, who had been unjustly sentenced to 11 and 12 years in prison for doing their job in shooting a drug smuggler near the Mexican border. The smuggler was merely wounded in his buttocks, while our border patrol agents were sent to prison for more than a decade. Yet GWB would not pardon the agents, even after one of them suffered a beating in prison at the hands of convicts hostile to law enforcement agents. Instead, GWB waited until his last full day in office, and then merely commuted their sentences, leaving the agents to linger for additional weeks in prison and be hampered in finding good jobs after they were finally released. Trump’s decisive pardon of Sheriff Joe is in welcome contrast to the effete leadership of the past. Sheriff Joe was elected six times by the fourth largest county in America, Maricopa County in Arizona, a hotbed of illegal immigration and widespread crime caused by the illegals whom Joe worked overtime to arrest. Trump’s pardon of Sheriff Joe was a necessary step to curb the misuse of the federal courts, which are now stacked with Obama and Clinton appointments who repeatedly rule in favor of liberal groups and against the will of the American people. In what took GWB years to do only incompletely on his last full day in office, it took only a few days for Trump to do completely at the first opportunity. The ACLU did not like Sheriff Joe’s approach to illegal immigration, and they used the federal courts to take punitive action against him. Without the benefit of a jury trial, a federal judge held that the publicly elected Sheriff Joe was in criminal contempt in how he did his job in protecting the American people against illegal aliens. The court ruling was contrary to the testimony of every witness in Sheriff Joe’s civil case, which had been brought by the ACLU. Sheriff Joe, now age 85, faced six months in jail and further litigation that would bankrupt him. Presidents should not wait for the legal system to destroy anyone before issuing a pardon to cut off the abuse. The justice in President Trump’s pardon is not merely that he exonerated Sheriff Joe, but that President Trump did it quickly to prevent further injustice against this hero. Although the presidential power to pardon is clear, criticism of Trump has ranged from the inane to the absurd. Some even objected that President Trump issued his pardon of Sheriff Joe during Hurricane Harvey, as though a president should allow a natural disaster to block his decision-making on all other important issues. Trump pointed out to a hostile press corps on Monday that President Clinton issued many pardons of shady characters. Obama, for his part, granted a record number of commutations while he was president, none as distinguished as Sheriff Joe. Prior Republican presidents would have been too cowardly to pardon Sheriff Joe, and Republican leadership in Congress pathetically criticizes Trump now. But the need to check judicial supremacy requires acting promptly to block the overreach, and Trump’s pardon of Sheriff Joe proved why he was Phyllis Schlafly’s choice, not an echo. Some comments are here. Unfortunately, Apple, Google, and many of our political leaders have turned against free speech. 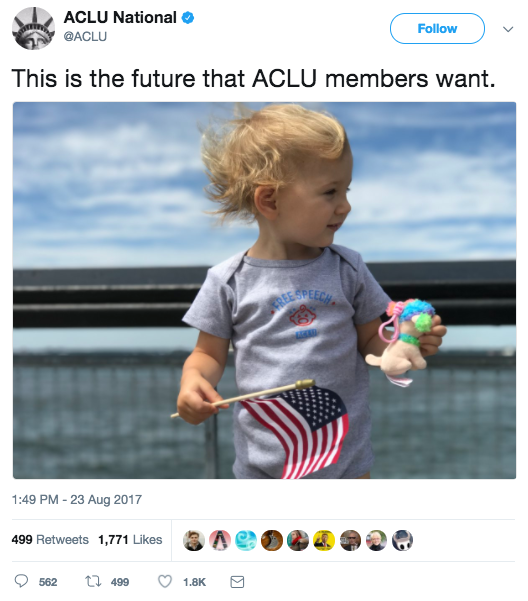 The ACLU apologized for using a white baby. The mob violence did not stop with Confederate generals, but quickly extended to statues of ordinary soldiers, and then to other great historical figures. Christopher Columbus was attacked with a hatchet in Detroit, Abraham Lincoln was burned in Chicago, and the recently canonized Father Junipero Serra was spray-painted with the word “murder” at Mission San Fernando, California. In Annapolis, Maryland, a sculpture of Chief Justice Roger Taney was hoisted from its massive pedestal and hidden in an undisclosed location as payback for Taney’s opinion in the 160-year-old Dred Scott case. In Baltimore a Columbus monument erected in 1792 was attacked with a sledgehammer and in New York City, the Council Speaker has demanded a review of the massive, 76-foot-high sculpture at the center of Columbus Circle. After President Trump asked “Where does it stop?,” some amateur historians responded by claiming that Robert E. Lee was a “traitor” who committed “treason” against the United States. Such comments are ignorant and wrong, for the simple reason that the 11 Confederate states that Lee fought for are now part of the United States. The Fourteenth Amendment, which became part of the Constitution in 1868, sets forth the conditions under which the defeated Southern states were readmitted to the United States on an equal basis with all other states. Nearly all who fought for Southern independence were restored to full citizenship on an equal footing with their counterparts who fought for the Union of North and South. A previous generation of Americans, including those who actually fought in the Civil War, debated whether to charge General Lee and other rebels as traitors. They wisely decided not to go down that road, and it’s too late to revisit their decision now. Some Republican weak sisters – the same people who timidly proposed civil unions as an alternative to gay marriage (remember how that turned out?) – have offered a compromise. Instead of destroying the offending statues, move them to museums or Confederate cemeteries. Gentlemen may cry peace, peace, but there is no peace: even cemeteries are not safe from the mob bent on the destruction of history. In Los Angeles, an online petition forced the Hollywood Forever cemetery to remove a 92-year-old hunk of granite that marks – “lest we forget” – the nearby graves of 37 Confederate soldiers. In Madison, Wisconsin, the leftwing mayor removed a two-foot plaque marking the graves of 140 Confederate soldiers who died in a Union prison at Camp Randall after surrendering in battle. In Boston, where over 600 Confederates were held at Fort Warren, a granite slab bearing the names of 13 who died in prison was boarded up so their names cannot be seen. History teaches what happens when a revolution gets out of hand, and it’s not pretty. When law and order are overthrown, the mob rules. When the French Revolution reached its peak of mob violence in 1793, the revolutionaries were not satisfied with slicing off the heads of their deposed king, Louis XVI, and his wife, Marie Antoinette. They also invaded the church of St. Denis, where French kings and queens for the preceding 1,000 years had been buried under monuments and statues that marked their lives and reigns. In our hometown of Alton, Illinois, two Civil War-related monuments have stood for more than a century at opposite ends of town. On the east side, a flamboyant 110-foot column, topped by a winged sculpture of an angel and flanked by a pair of enormous eagles, honors Rev. Elijah P. Lovejoy, the anti-slavery newspaper publisher who died defending his printing press from a mob on Nov. 7, 1837. On the quieter western edge of town, a simple but elegant granite obelisk, 58 feet tall, marks the final resting place of 1,354 Confederate soldiers who died as prisoners of war in Alton’s federal prison. More than 13,000 Confederate soldiers and civilians were imprisoned there under horrific conditions during the war, resulting in as many as six to 10 deaths a day. For as long as civilization has existed, the end of life on earth has been a time to remember the dead and to reflect on what their lives meant to us who survive. It’s time for the grave robbers and defilers to stand down, or if they will not, to be put down by the law. Requiescat in pace.